Antheraea yamamai, also known as the Japanese oak silk moth, is a wild species of silk moth. Silk produced by A. yamamai, referred to as tensan silk, shows different characteristics such as thickness, compressive elasticity and chemical resistance compared to the common silk produced from the domesticated silkworm, Bombyx mori. 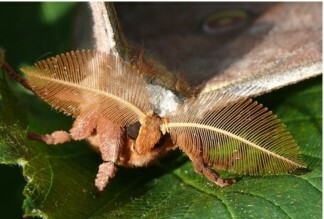 Its unique characteristics have led to its use in many research fields including biotechnology and medical science, and the scientific as well as economic importance of wild silk moth continues to gradually increase. However, no genomic information for wild silk moth, including A. yamamai, is currently available. In order to construct the A. yamamai genome, a total of 147G base pairs using Illumina and Pacbio sequencing platforms were generated, providing 210-fold coverage based on the 700 Mb estimated genome size of A. yamamai. The assembled genome of A. yamamai was 656 Mb(>2kb) with 3,675 scaffolds and the N50 length of assembly was 739 Kb with 34.07% GC ratio. Identified repeat elements covered 37.33% of the total genome and the completeness of the constructed genome assembly was estimated to be 96.7% by BUSCO v2 analysis. A total of 15,481 genes were identified using Evidence Modeler based on the gene prediction results obtained from 3 different methods (ab initio, RNA-seq based, known-gene based) and manual curation. Here we present the genome sequence of A. yamamai, the first genome sequence of wild silk moth. These results provide valuable genomic information which will help enrich our understanding of the molecular mechanisms related to not only specific phenotypes such as wild silk itself but also the genomic evolution of Saturniidae. Sample source:National Academy of Agricultural Science, Rural Development Administration, Korea. Displaying 1-10 of 31 Sample(s).